We not only provide delicious food but we also work to tackle some of the biggest issues in society today. See the ways that our offerings can improve health and wellbeing and how we strive to achieve environmental sustainability through sourcing local suppliers. Here at Sodexo we are always looking for talented Chefs, Front of House Staff, Cleaners, Office Workers and much more. 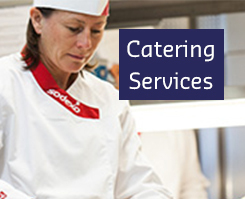 Find out whether Sodexo have got the right opportunity for you today.